At 11:18 AM on the cloudless morning of Thursday, September 1, 1859, 33-year-old Richard Carrington—widely acknowledged to be one of England’s foremost solar astronomers—was in his well-appointed private observatory. Just as usual on every sunny day, his telescope was projecting an 11-inch-wide image of the sun on a screen, and Carrington skillfully drew the sunspots he saw. On that morning, he was capturing the likeness of an enormous group of sunspots. Suddenly, before his eyes, two brilliant beads of blinding white light appeared over the sunspots, intensified rapidly, and became kidney-shaped. Realizing that he was witnessing something unprecedented and “being somewhat flurried by the surprise,” Carrington later wrote, “I hastily ran to call someone to witness the exhibition with me. On returning within 60 seconds, I was mortified to find that it was already much changed and enfeebled.” He and his witness watched the white spots contract to mere pinpoints and disappear. What Carrington saw was a white-light solar flare—a magnetic explosion on the sun. It was 11:23 AM, only five minutes had passed. Just before dawn the next day (2 September), skies all over Earth erupted in red, green, and purple auroras so brilliant that newspapers could be read as easily as in daylight. Indeed, stunning auroras pulsated even at near tropical latitudes over Cuba, the Bahamas, Jamaica, El Salvador, and Hawaii. The auroral current could be used for transmitting and receiving telegraphic dispatches. This was done between 8:30 and 11:00 in the morning, on September 2, 1859, on the wires of the American Telegraph Company between Boston and Portland, and upon the wires of the Old Colony and Fall River Railroad Company between South Braintree and Fall River, among others. The length of time during each positive wave was only, however, 15 to 60 seconds. The following account came from between Boston and Portland. At which point, the Boston operator began transcribing 19th Century Vintage erotica (ok, just kidding on that one). Meanwhile on the early morning of 2 September 1859. The clipper ship Southern Cross was off Chile when, at 1:30am, it sailed into a living hell. Hailstones from above and waves from all around whipped the deck. When the wind-lashed ocean spray fell away to leeward, the men noticed they were sailing in an ocean of blood. The color was reflected from the sky, which, they could see – even through the clouds – was wreathed in an all-encompassing red glow. The sailors recognized the lights as the southern aurora that usually graced the skies near the Antarctic Circle, just as their northern counterparts cling to the Arctic. To see them from this far north was highly unusual. As the gale subsided, they witnessed an even more astonishing display. Fiery lights loomed against the horizon as if some terrible conflagration had engulfed the Earth. Vivid bolts flew across the now clear sky in spiral streaks and exploded in silent brilliance, as if the very souls of all humanity were fleeing whatever cataclysm had befallen the planet. Upon their arrival at San Francisco, the ship’s company discovered that theirs was not an isolated experience. Two thirds of the Earth’s skies had been similarly smothered. “…..Fast-forward one hundred and fifty-three years to late 2012 or 2013 . A globalized world is extremely dependent upon electronic communications to operate banking, communications, health care, computers, transportation systems, and a massive electric grid serving billions of people. A super solar flare on the scale of the one in 1859 could shut down modernity for days, weeks, perhaps months depending on the size of the white solar flare eruption from within a sunspot. One could equate such a possible episode as a Cosmic Katrina-like event on a nearly global scale happening in say less than twenty-four hours and possibly affecting millions of people. Still, more recent examples include the events of March 13, 1989, in which Hydro-Quebec’s power output was completely shut down within 92 seconds, courtesy of two solar CMEs. Power was restored in nine hours and a large transformer in New Jersey was destroyed. There was also the supply disruption that took place on Halloween 2003, including the destruction of 14 transformers in South Africa, which contributed significantly to that country’s long-running struggle to adequately provide its people and industries with electricity. Unfortunately, current projections by NASA suggest that we may soon be due for a CME on the scale of the 1859 event. According to Dr Richard Fisher, director of the agency’s heliophysics division, solar flare activity varies in accordance with an 11-year cycle and is currently emerging from a quiet period, while the sun’s magnetic energy peaks every 22 years. As a result, solar activity is set to reach its maximum during the 2012-2015 period. The point of greatest vulnerability in our electricity networks is the transformer. A simulation conducted by Metatech indicated that a geomagnetic storm roughly 10 times the strength of that seen in 1989 could melt the copper windings of around 350 of the highest voltage transformers in the US, effectively knocking out a third of the entire US power grid and impacting an area 10 times that of the 1989 storm. Furthermore, the large size of the damaged transformers would effectively prevent field repairs and in most cases, new units would have to be shipped in from abroad, ensuring that their replacement would take weeks or even months. Given that other countries could also be adversely affected and that the majority of transformers are manufactured in Brazil, China, Europe and India, there is no guarantee that the US would be the first priority for resupply in such an event. Although the industry has weathered geomagnetic storms of the highest (K9) classification since 1989 with little impact on performance, thanks to specialized operating procedures, all these storms were much less intense than the 1989 storm. Vulnerability has been increased by the fact that in the US, there has been a marked increase in the voltages used in today’s networks. Now, networks operate at around 345-765kV, compared to the 100-200kV design thresholds seen in the 1950s. The higher the voltage, the lower the resistive impedance per unit distance and the higher the geomagnetically-induced currents (GICs) generated in the event of an EMP. 1) ‘Valentine’s day’ X2.2 flare occurred Tue. 15 Feb 2011, particles began arriving at Earth Fri. 18 Feb 2011. This was kind of a small one, it wasn’t a big solar eruption, about one-tenth of the biggest that we have ever seen. *It wiped out radio communications in the Western Pacific Ocean and parts of Asia and caused airlines to reroute some polar flights to avoid radio outages. 2) X28 The largest measured solar flare occurred on November 4, 2003, fortunately this flare only grazed Earth. The x-rays from this storm were so powerful that it overloaded the Geostationary Operational Environmental Satellite (GOES) that was measuring the sun. 3) X20 Flares on April 2, 2001 and August 16, 1989. Had these flares been pointing at the Earth, the damage to the satellites and power systems could have been substantial. 4) 2 September 1859: There was a solar storm (discussed above) that hit in the late 19th century; had it occurred today would probably take out most of the world’s power grids, it could induce electrical currents that would knock out at least 300 of the USA’s main transformers cutting off power to 130 million people, all within 90 seconds. • The UV and light effects of a solar flare arrive at Earth in about 8 minutes traveling at the speed of light. Particles ejected from a powerful, concentrated explosion may arrive in as soon as 12 hours and are referred to as a plasma bullet’. Typically, the technology disrupting CME’s charged particle storm front take about 3 days to travel the 93 million mile intervening distance. • Each category for x-ray flares has nine subdivisions ranging from, example, C1 to C9, M1 to M9, and X1 to X9+. • Solar Flares are not visible from earth with the naked eye. 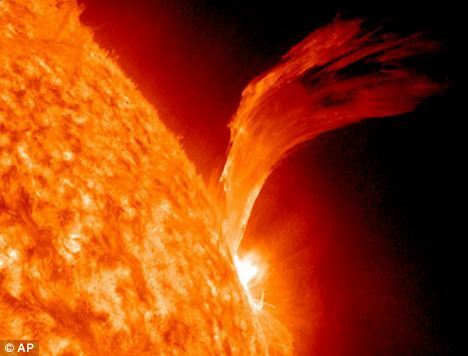 The latest solar flare, one of the strongest felt in decades, has been likened to a solar tsunami that seems to be coming in waves and crashing into the earth’s atmosphere. What was originally thought to be nothing more than a nuisance causing an hour or two of mild electronic disruptions on the morning of August 4th, 2011 has now turned a bit more sinister. There continue to be intermittent outages of radio and television broadcasts as well as cell phone and internet services well into day two of the flare. Residents in extremely sunny locales around the globe are cautioned to remain indoors until the threat of solar flare-induced sneezing has passed. Symptoms include an itching in the nostrils and then a sneeze, sometimes coming in rapid succession. It is not know how the solar flare is affecting the outer body but residents are warned against going outdoors without wearing protective clothing until more information can be gathered on this most unusual occurrence. What happens if the industry fails? Assuming a CME of sufficient magnitude was to knock out power supplies across the US for a period of several weeks, the most pressing immediate issue, particularly in arid states such as Nevada would be the loss of water supplies, due to the lack of electricity to pump water. In terms of time scale, the UK’s National Risk Register, points out that loss of mobile communications occurs within one hour of disruption, water and sewerage within six hours. Other important concerns include the knock-on effects in terms of primary fuels. Coal mining operations require electricity supplies as do oil and gas extraction. As of writing, the US has around 23 days of crude oil and gasoline supply in hand (and ~44 days of distillates). However, electric pumps are needed to deliver oil and gas via pipelines and even to deliver petrol at the pumps. There are also the massive logistical issues that energy companies would be faced with in the event of a long-lasting power disruption. In the absence of computers and electronic records, ensuring steady deliveries of fuel would become a nightmare, not least due to the horrors of processing transactions when all major financial institutions are effectively compromised. Furthermore, the potential for civil disorder would create an unwelcome dilemma for any workers, given the conflict between keeping watch over their families and reporting for duty. In the case of the UK, the National Risk Register, which was revised this April, warns that organizations should “prepare for the possibility of total loss of electricity for an entire region for up to 24 hours, and to some rural areas for up to one week.” It somewhat confidently states that “if there is an unexpected shutdown of the grid, power will begin to be restored across the grid over three days.” Given the issues associated with transformer replacement as detailed, earlier, this suggests that UK contingency plans may be inadequate in the event of a major GMD (geomagnetic disturbance). The ice storm that affected Eastern Canada in 1998 and its immediate aftermath is a good example of what happens when electricity supplies are disrupted. It left 4 million people without electricity and resulted in the cessation of almost all economic activity for weeks. Only the continued operation of a single power line to the Montreal island prevented the need to evacuate 1m people due to water shortages. The disruption is estimated to have cost US$5-7bn for all affected areas. In contrast, a similar outage in 1961 had much less of an effect, as the transition to IT-based systems for infrastructure had yet to take place. The National Academy of Sciences puts the total economic cost of a widespread power disruption triggered by solar activity at 20 times that of Hurricane Katrina, which after devastating New Orleans, racked up damages equivalent to around US$125bn. At US$2.5tn, this would be roughly equivalent to 17.5 per cent of entire US annual GDP. It also warns that such an event could knock out GPS navigation, air travel and emergency radio communications, adding to the difficulties in bringing an appropriate response to bear. (Excerpts) – “IT IS midnight on 22 September 2012 and the skies above Manhattan are filled with a flickering curtain of colorful light. Few New Yorkers have seen the aurora this far south but their fascination is short-lived. Within a few seconds, electric bulbs dim and flicker, then become unusually bright for a fleeting moment. Then all the lights in the state go out. Within 90 seconds, the entire eastern half of the US is without power. “A year later and millions of Americans are dead and the nation’s infrastructure lies in tatters. The World Bank declares America a developing nation. Europe, Scandinavia, China and Japan are also struggling to recover from the same fateful event – a violent storm, 150 million kilometers away on the surface of the sun. “We’re moving closer and closer to the edge of a possible disaster,” says Daniel Baker, a space weather expert based at the University of Colorado in Boulder, and chair of the NAS committee responsible for the report. First to go – immediately for those in high-rise buildings – is drinkable water. With no trains, no trucks, no cars (filling stations wouldn’t be able to pump gas) supermarket shelves would empty very quickly. Back-up generators would run out of fuel in less than 72 hours. After that, hospitals shut down. No more modern healthcare. And with the factories shuttered, no more medications. And forget nuclear power. The stations are programmed to shut down in the event of serious grid problems and are not allowed to restart until the power grid is up and running, the report says. With no power for heating, cooling or refrigeration systems, people could begin to die within days. See entire article by Michael Brooks. Recent warnings by NASA that the Sun’s current lack of activity may soon come to an end with dire implications for the world’s power sector have refocused attention on the effort being made to harden the world’s electricity networks against electromagnetic interference. Current projections by NASA suggest that we may soon be due for a CME on the scale of the 1859 event. According to Dr Richard Fisher, director of the agency’s heliophysics division, solar flare activity varies in accordance with an 11-year cycle and is currently emerging from a quiet period, while the sun’s magnetic energy peaks every 22 years. As a result, solar activity is set to reach its maximum during the 2012-2015 period. The point of greatest vulnerability in our electricity networks is the transformer. A simulation conducted by Metatech indicated that a geomagnetic storm roughly 10 times the strength of that seen in 1989 could melt the copper windings of around 350 of the highest voltage transformers in the US, effectively knocking out a third of the entire US power grid and impacting an area 10 times that of the 1989 storm. Furthermore, the large size of the damaged transformers would effectively prevent field repairs and in most cases, new units would have to be shipped in from abroad, ensuring that their replacement would take weeks or even months. Given that other countries could also be adversely affected and that the majority of transformers are manufactured in Brazil, China, Europe and India, there is no guarantee that the US would be the first priority for resupply in such an event. Although the industry has weathered geomagnetic storms of the highest (K9) classification since 1989 with little impact on performance, thanks to specialized operating procedures, all these storms were much less intense than the 1989 storm. “A severe solar storm could cause global chaos, wrecking satellite communications and would take down the most important power grids in the world for a period of years. The National Oceanic and Atmospheric Administration (NOAA) forecasts four “extreme” and many “severe” solar emissions which could threaten the planet during the current decade. NASA has warned that a peak in the sun’s magnetic energy cycle and the number of sun spots or flares around 2013 could generate huge radiation levels. This is a special problem in the United States and especially a severe threat in the eastern United States. Government studies showed that “extreme” solar flare emissions can cause blackouts for weeks, months or even years, in very large areas of the nation. An extremely large solar storm would induce geomagnetic currents that could destroy a substantial fraction of the very largest transformers on the power grid. If this happened, electric power loss due to a large solar storm would be out for a period of years and possibly decades. Last month, the Nuclear Regulatory Commission said that U.S. plants affected by a blackout should be able to cope without electricity for atleast eight hours and should have procedures to keep the reactor and spent-fuel pool cool for 72 hours. Nuclear plants depend on standby batteries and backup diesel generators. Most standby power systems would continue to function after a severe solar storm, but supplying the standby power systems with adequate fuel, when the main power grids are offline for years, could become a very critical problem. If the spent fuel rod pools at the country’s 104 nuclear power plants lose their connection to the power grid, the current regulations are not sufficient to guarantee those pools won’t boil over, exposing the hot, zirconium-clad rods and sparking fires that would release deadly radiation. Our highly technological modern society is great in a lot of ways…and really, really bad in one specific way: it’s very delicate. The electronics, computers, and circuit boards that run everything in our lives could be instantly fried by either a naturally occurring solar flare, or the “electro-magnetic pulse” of a single nuclear weapon fired high in our atmosphere. Electricity would be shut off. Water, pumped from afar, would stop coming out of faucets. There would be no communications. Most recent cars wouldn’t run. Access to food and emergency care would be cut off. And in the resulting chaos, there are estimates that as much as 90% of Americans could die. But in the Senate, they said “where are the votes for us if we fund this?” and, not finding any, they killed it. And maybe us. Of course, $100 million is a lot of money. But it’s only 1/1650th of what congress added to our debt in just one week. And only 1/260th of what the Democrats just decided to give to teachers’ unions to buy more votes for November. By comparison, potentially saving the Earth seems like it could have been a pretty good deal. But since it didn’t happen, we can all continue to look toward the sun…and hope for no change. The Sun provides the energy needed for life to exist on Earth. Every so often, sunspots and solar flares occur on the Sun’s surface and can cause disruptions in our daily lives. From the invention of the telescope in the 17th Century to NASA’s Nimbus-7 satellite, innovations have allowed us to gaze into space and study the sun and moon in amazing detail. The sun is constantly changing and we have been studying sunspots, solar flares and other solar phenomena for hundreds of years. The sun emits radiation across the entire electromagnetic spectrum. • Visible: This part of the spectrum, which we can detect with our eyes, allows us to see and provides the energy for plants to produce food by photosynthesis. • Ultraviolet (UV): We cannot see this part of the spectrum, but it can damage unprotected skin, producing anything from a mild to severe burn to skin cancer. • Infrared: This part of the spectrum is made up of invisible rays that provide the heat that helps keep the Earth warm. • Charged Particles: The sun continuously emits energy and particles that make up the solar wind. When the charged particles interact with the Earth’s magnetic field, particularly near the poles, the result is the aurora borealis, which is a spectacular display of color in the night sky. The solar wind has a speed ranging from 300 to more than 1000 km/s, with an average of about 400 km/s. Its composition is very similar to the solar one, i.e., it’s 80% hydrogen with 20% Helium. However, as the outer solar atmosphere (solar corona) has an extreme temperature of about 1 million K, this highly rarefied gas is fully ionized, a condition called a gas plasma. Therefore, the solar wind is made mostly of protons (hydrogen nuclei) and free electrons (>50% of solar wind particles). This vast medium permeated by this steady outward stream of particles is often called the heliosphere, and extends to about 170 times the Sun-Earth distance where its merges with the interstellar medium. Despite its very low density (about one particle per cubic cm at the distance of the Earth), the solar wind exerts a substantial dynamical pressure on the Earth magnetic field. The Earth magnetosphere thus takes the shape of an elongated “bubble” floating in the solar wind, with a bow shock on the Sun-facing side and a very long magneto tail away from the Sun. Acting as magnetic bottle, the magnetosphere stores particles originating in the solar wind in toroidal radiation belts, the so-called Van Allen belts, a few solar radii above the Earth Equator. One can then easily understand that any change in the speed, density and direction of the wind will cause deformations and compressions of this magnetic container with various drastic consequences that we will describe soon. Sunspots are dark areas that form and disappear on the surface of the Sun over periods of days or weeks. Sunspots are caused by concentrated magnetic fields that reduce the amount of energy flow to the surface of the sun from its interior. The reduced energy flow causes the area to cool from about 10,800 ºF (the average temperature of the Sun’s surface) to 7,600 ºF. Because sunspots are cooler than the rest of the Sun, they appear dark on the Sun’s surface. Sunspots are so big that all of planet Earth would fit into a sunspot. Solar flares are the release, in a single burst, of energy in many forms – electro-magnetic (from radio waves through the visible spectrum to gamma rays and x-rays), energetic particles (protons and electrons), and matter that is so hot it is in the form of plasma. Flares are characterized by their brightness in x-rays. The National Oceanic and Atmospheric Administration monitors the x-rays from the Sun with detectors on some of its satellites. Observations for the last few days are available at NOAA’s website, Today’s Space Weather. Flares are closely related to the cycles of the Sun’s magnetic field, and they emerge from relatively cool, intensely magnetic regions of the solar surface – sunspots. The energy released during a flare is typically ten million times greater than the energy released from a volcanic explosion. Even then, it only releases a fraction of the total energy emitted by the Sun every second. The radiation and radioactive particles released during solar flare activity can damage satellites and interrupt radio communications on Earth. Coronal mass ejections are the sudden release of large masses of plasma from the very hot corona, which is the atmosphere just above the surface of the sun. CMEs expand away from the Sun at speeds as high as 4 million miles per hours! The light and x-rays accompanying a CME reach earth in a few minutes. The mass of particles may take three to five days to arrive. Solar flares are occasionally accompanied by Coronal Mass Ejections. A typical CME is composed of 1-10 billion tons of particles and combined with solar flares are the biggest “explosions” in our solar system, roughly approaching the power in ONE BILLION hydrogen bombs! See image at left. Coronal mass ejections are the sudden release of large masses of plasma from the very hot corona, which is the atmosphere just above the surface of the sun. CMEs expand away from the Sun at speeds as high as 4 million miles per hours! The light and x-rays accompanying a CME reach earth in a few minutes. The mass of particles may take three to five days to arrive. (The associated picture, taken by the SOHO [Solar and Heliospheric Observatory] spacecraft, shows a CME. Coronal mass ejections are more likely to have a significant effect on our activities than solar flares because they carry more material into a larger volume of interplanetary space, increasing the likelihood that they will interact with the Earth. CMEs typically drive shock waves that produce energetic particles that can be damaging to both electronic equipment and astronauts that venture outside the protection of the Earth’s magnetic field. While a flare alone produces high-energy particles near the Sun, a CME can reach the Earth and disturb the Earth’s magnetosphere, setting off a geomagnetic storm. Often, these storms produce surges in the power grid and static on the radio, and, if the waves of energetic particles are strong enough, they can overload power grids and drown out radio signals. This type of activity can also affect ground to air, ship to shore, and navigational communication, military detection, and early warning systems. Observing the ejection of CMEs from the Sun provides an early warning of geomagnetic storms. Only recently, with SOHO, has it been possible to continuously observe the emission of CMEs from the Sun and determine if they are aimed at the Earth. NASA has created a new project called “Solar Shield” in an effort to prevent damage to key transformers in the case of a severe solar storm. To protect power systems in the event that another powerful solar storm should occur, NASA has developed a project called “Solar Shield,” which has the potential to shelter high-voltage power lines that crisscross over North America. Considering the length of these power lines has “increased nearly 10 fold” since the beginning of the Space Age, it is critical to consider the effect a solar storm could have on power systems in the United States and throughout the world. Geomagnetically induced currents (GICs) are the main problems when it comes to power grids during geomagnetic storms. When a CME approaches Earth’s magnetic field, it causes the field to shake. This quiver causes currents from the ground to Earth’s upper atmosphere, and powerful GICs can trip breakers, overload circuits and melt the windings of transformers. Transformer damage leads to large-scale blackouts, and these transformers cannot be repaired in the field. They must be replaced, which is both expensive and time consuming. The CME typically takes 24 to 48 hours to cross the Sun-Earth divide. During this time, NASA researchers at the Goddard Community Coordinated Modeling Center (CCMC) are gathering physics-based computer programs to model the CME. Thirty minutes before impact, ACE, a spacecraft stationed 1.5 million km “upstream from Earth,” uses its sensors to make in situ measurement’s of the CME’s magnetic field, density and speed, then sends the data to the Solar Shield team on Earth. The data is fed into CCMC computers where models predict currents and fields in Earth’s upper atmosphere and transmit this information to the ground. The Solar Shield team is then prepared to send alerts to utilities with details about the GICs. The Earth is constantly bombarded with a stream of accelerated particles arriving not only from the Sun, but also from interstellar and galactic sources. Study of these energetic particles, or cosmic rays, contributes to our understanding of the formation and evolution of the solar system, as well as the astrophysical processes involved. The Advanced Composition Explorer (ACE) spacecraft carries six high-resolution sensors and three monitoring instruments to sample low-energy particles of solar origin and high-energy galactic particles. From a vantage point approximately 1/100 of the distance from the Earth to the Sun, ACE performs measurements over a wide range of energy and nuclear mass, under all solar wind flow conditions and during both large and small particle events including solar flares. ACE provides near-real-time solar wind information over short time periods. When reporting space weather, ACE can provide an advance warning (about one hour) of geomagnetic storms that can overload power grids, disrupt communications on Earth, and present a hazard to astronauts. ACE orbits the L1 libration point which is a point of Earth-Sun gravitational equilibrium, about 1.5 million km from Earth and 148.5 million km from the Sun. The elliptical orbit affords ACE a prime view of the Sun and the galactic regions beyond. Dr. Nathan Schwadron, co-investigator on the IBEX mission at Boston University, said: “The interstellar medium, which is part of the galaxy as a whole, is actually quite a harsh environment. There is a very high energy galactic radiation that is dangerous to living things. “Around 90 per cent of the galactic cosmic radiation is deflected by our heliosphere, so the boundary protects us from this harsh galactic environment.” The heliosphere is created by the solar wind, a combination of electrically charged particles and magnetic fields that emanate a more than a million miles an hour from the sun, meet the intergalactic gas that fills the gaps in space between solar systems. At the boundary where they meet a shock wave is formed that deflects interstellar radiation around the solar system as it travels through the galaxy. Without the heliosphere the harmful intergalactic cosmic radiation would make life on Earth almost impossible by destroying DNA and making the climate uninhabitable. Measurements made by the Ulysses deep space probe, which was launched in 1990 to orbit the sun, have shown that the pressure created inside the heliosphere by the solar wind has been decreasing. If the heliosphere continues to weaken, scientists fear that the amount of cosmic radiation reaching the inner parts of our solar system, including Earth, will increase. Solar flares and coronal mass ejections result in the release of radiation across the spectrum, from x-rays to light waves to fast-moving protons to plasma. We know that satellites can be affected (even made non-functional) and astronauts need to be aware of the risk and seek shelter during these storms. Astronauts on the Space Station receive increased exposure during these solar phenomena. The energetic particles from a flare or CME would be dangerous to an astronaut on a mission to the Moon or Mars. As for sunspots, they are merely cooler regions of the sun and do not cause any particular harm. Out of all of the Sun’s activities, it is actually the Sun’s UV rays that pose the greatest risk to human health. • Cover Up: Wear tightly woven, loose-fitting, and full-length clothing. • Wear Sunglasses that Block 99-100% of UV Radiation: Sunglasses that provide 99-100% UVA and UVB protection greatly reduce sun exposure that can lead to cataracts and other eye damage. • Always Use Sunscreen: Apply a broad spectrum sunscreen with a Sun Protection Factor (SPF) of 15 or higher liberally on exposed skin. Reapply every 2 hours, or after working, swimming, playing, or exercising outdoors. • Check daily the UV Index: The UV Index provides important information to help people plan outdoor activities in ways that prevent overexposure to the sun. This information is commonly found near weather predictions in newspapers and on the internet sites, like EPA’s Sunwise UV Index site.